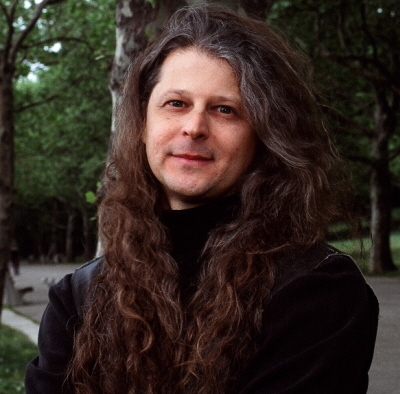 Composer and virtuoso guitar player Kampela is the winner of the 1995 International Guitar Composition Competition (Caracas, Venezuela) and winner of the 1998 Lamarque-Pons Guitar Composition Competition (Montevideo, Uruguay). He has received commissions and awards from the Guggenheim Foundation (2014), Collegium Novum Zurich (2013), DAAD (Artist-in-Residence Berliner Künstlerprogramm 2012-13), The New York Philharmonic (2009), Koussevitzky Foundation (2007), Fromm Music Foundation (1998), ISCM/World Music Days Stuttgart 2006, Germany, Rio-Arte Foundation, Brazil (1999) and fellowships from the Brazilian Government (CNPq) and Columbia University (1990-1998), among many others. Kampela has broken new ground in two particular ways: first, in his native country he has fused popular and vernacular styles with contemporary textural techniques. His 1988 CD ‘Epopéia e Graça de uma Raça em Desencanto… (‘Epic and Grace…’)’ uses popular music forms deconstructing samba, jazz, musical theater, with new music’s resources creating a true hybrid genre. Second, working with new extended-techniques for acoustic instruments. In his series of Percussion Studies for solo guitar (1989-present), Kampela has created an entirely new playing technique. He is currently considered one of the most important innovators of the guitar. He subsequently extended these techniques to diverse acoustic instruments creating complex compositional designs based on ergonomics and mortoric considerations. Several Doctorate thesis across the globe have been written about Kampela’s music, theory and extended-techniques principally the ones focusing on his theoretical ideas of Micro-Metric Modulation and on his ‘Percussion Studies’ for guitar (i.e. Graziela Bortz (2003), Paulino de Oliveria Neto (2010), Marlon Titre (2013), Fernando Cury (2006 Masters/2014 Doctorate), among many others). Some recent compositional commissions/projects: Das Tripas Coração (‘From the Guts, heart’) for 2 pianos and 2 percussion for the Berlin Piano-Percussion Ensemble, commissioned by the DAAD and the MaerzMusik Festival Berlin. Premiered on March 19th 2014; Migro for guitarist and 5 mobile ensembles commissioned by the Collegium Novum Zurich for the Tage Für Neue Music Festival, Zurich, Switzerland. Soloist Arthur Kampela, Jonathan Stockhammer conductor, November 14, 2013; Ultraschall Festival Berlin with a three concerts’ retrospective presenting some of his large chamber works (i.e. Antropofagia and “…B…”) and the premiere of Máquina do Mundo (‘The Machine of the World’) for solo contrabass clarinet played by Theo Nabicht, January 18 and 19, 2013; "...B..." for 10 instrumental soloists, video and electronics premiered on July 19th at the Darmstadt Ferienkurse 2012, Germany, performed by the Linea Ensemble of Strasbourg, Jean-Philippe Wurtz, conductor (Koussevitzky commission); Uma Faca Só Lâmina (‘A Knife All Blade’) for String Quartet premiered on May 2013 at Americas Society NYC by the Momenta String Quartet; As If, trio for guitar accordion and clarinet commissioned by the Warsaw Autumn Festival 2013 and guitarist Klara Tomljanović; Premiere of Motets for 2 guitars at the Église Saint-Maurice (Cathedral) Reims, France, by the Newman and Oltman Guitar Duo, 2011; Not I for horn solo, horn player's voice and light, premiered in November 2011 in Freiburg as well as at the Konzerthaus Berlin (May 2012) by Delphine Gauthier-Guiche; Premeiere of MACUNAÍMA by the New York Philharmonic conducted by Magnus Lindberg 2009; Elastics II for flutes, guitar and electro-acoustic sounds and Percussion Study V for viola alla chitarra and electroacoustic sounds at the Museum of Modern Art of Strasbourg, France - Linea Ensemble, Pablo Marquez, guitar/viola and Mario Carolli, Flute(s) (2007); Premiere of Antropofagia at the ISCM 2006 (World Music Days) at the Theaterhaus Stuttgart by the Kammerensemble Neue Musik Berlin and Wiek Hijmans, on electric guitar (Fromm Commission), etc. Kampela's works have been performed in South-America, Europe, Asia and the USA. He holds a Doctorate in music composition from Columbia University where he studied with Mario Davidowsky and Fred Lerdahl. Previously, he studied with Ursula Mamlok at Manhattan School of Music (1992). He has also received private lessons from British composer Brian Ferneyhough (1993). In Brazil (1986-8) he studied with the German composer Hans-Joachim Koellreutter. Kampela has been writing on his theoretical ideas on Micro–Metric Modulation and on extended-techniques such as in his 1998 Doctoral Dissertation “Micro-Metric Modulation: New Directions in the Theory of Complex Rhythms.” His article “A Knife All Blade: Deciding the Side Not To Take” appeared in the Current Musicology Journal (Columbia University 67-8) in 2001. More recently (2013), he contributed with the article "Micro-Metric Rhythms and Noises Emanations from the Stochastic Cloud" to a new book on Xenakis published in November 2012 by Pendragon Press. Graziela Bortz, from CUNY, NYC wrote her DMA dissertation (“Rhythm in the Music of Brian Ferneyhough, Michael Finissy and Arthur Kampela: A Guide for Performers,” 2003) based on Kampela's theory of Micro-Metric Modulation in order to analyze the rhythmic strata of her thesis' subjects.